As legislators consider yanking funding in this year’s budget amid Department of Health delays on medical marijuana regulations, the parents who lobbied for legalization say the reality has fallen short of what they hoped for when the drug was broadly legalized for medical use. A limited number of growers has meant fewer varieties they can test to try managing Rebecca's condition, and she still has around 50 seizures a day, Hyman said. Even the varieties that are available are in low supply. "With the current system, you're very limited to the strains of product that are available," said Hyman, who has been hired by a law firm specializing in medical marijuana cases. "Some patients can't even get their medicine." Months after the legislature passed a law enacting a constitutional amendment that broadly legalized medical marijuana, patients say they are hampered by delayed regulations yet to be implemented by state health officials. The Department of Health's Office of Medical Marijuana Use, which is devising and implementing rules to implement the law, has blamed administrative challenges and lawsuits for the delays. In recent weeks, lawmakers have become especially dissatisfied with those explanations. After a series of deadlines were missed and letters objecting to some rules went unanswered for months, lead legislators have called the office's behavior disrespectful and are discussing yanking funds from the department as they assemble the state's budget in the next four weeks. But particularly frustrated are the patients' parents, who lobbied the legislature for years to legalize medical marijuana in the first place. "I'm certainly happy to see the legislature really, truly apply some pressure," said political consultant Ben Pollara, who led the group behind the 2016 constitutional amendment. "Patients would like it, too. What they would like more is for [the department] to apply the law." When applications for identification cards to obtain medical marijuana were first opened, delays stretched for months at a time, Hyman said. "I know patients who had to wait 90 days-plus to get their card, or patients who waited 60 days and finally got an answer saying, 'Oh, your picture's wrong,'" he remembered. Lawmakers have been asking for answers from the Department of Health regarding those delays, and since October, a joint legislative committee has sent more than a dozen letters objecting to rules on issues ranging from medical marijuana licenses to caregivers' ID cards. But the office did not respond to the letters until last Friday, when the Department of Health's general counsel wrote that the committee's objections might cause more delays. Legislators were particularly incensed by that letter at a joint committee meeting last week. Christian Bax, the agency's head, sat mute while its members voted unanimously to object to some of its emergency rules. 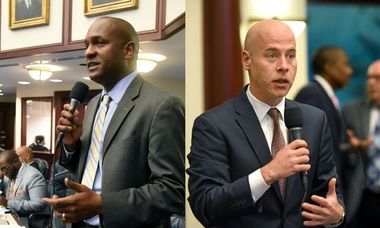 Sen. Kevin Rader, D-Delray Beach, a committee chair, called the lack of responsiveness insulting and told reporters that the Legislature should consider targeting the office's funding. Legislators have already begun making moves to flex their spending muscle. Last week, Rep. Jason Brodeur, R-Sanford, pushed an amendment in the House budget to freeze $2.1 million in salary and funds at the Department of Health. Sen. Rob Bradley, R-Fleming, the powerful chairman of the Senate Appropriations Committee, said he agreed with the measure and added Wednesday that legislators were considering using "the power of the purse" to respond to the Department of Health's inaction. Department spokeswoman Mara Gambineri said the agency is working toward implementing all required regulations and that it plans to respond to legislators' concerns. "There is access to medical marijuana right now," she said. "Patients are receiving medication, and every day we continue to process new applications… . Those parts and pieces are moving simultaneous to the rule-making progress we're making." But the department is responsible for implementing those rules in a timely fashion, Pollara said. In the meantime, "the patients are the ones who are taking this on the chin." Some parents have already taken matters into their own hands. Moriah Barnhart, who helped push for medical marijuana after her daughter, Dahlia, was diagnosed with a brain tumor, said even though the application process has been open for months, she is still getting her daughter's medical marijuana from out of state and has not applied for a card. "I've never gotten a legal product from the state of Florida," said Barnhart, citing the long wait time and cost of a card. "We really don't have the means to obtain the meds Dahlia needs regularly." If rules had been established more quickly, "we would have everything — everything that was supposedly implemented to date would be implemented," she said. "As much as I wanted this to work out, we just need to admit we are not where we are supposed to be."